Clamshells are made of plastic, and used to mold and package soaps, lotion bars, bath bombs, and wax tarts. Customers love these to quickly make soaps for upcoming craft shows or to make a large quantity of soap for a special occasion such as a wedding. 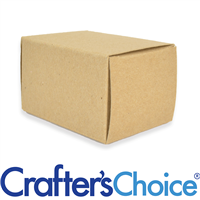 Use the Basic Kraft Box to package multiple bars of soap, bath bombs, lip balms and more! 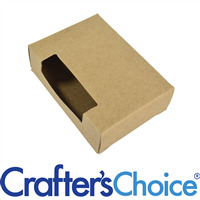 Decorate this 100% recycled kraft box with your label or design before gifting or selling. 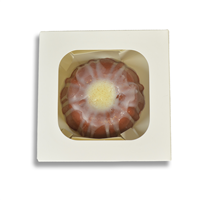 The Basic White Gift Box can be used to package a variety of your handmade soaps and cosmetics. The white, glossy finish allows for easy application of labels and can be designed as you wish. 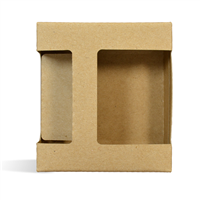 Closed Box Measurements: 3 1/8" x 4" x 1 1/4"
This box will arrive flat and requires minor tucks and folds to assemble. Arch folds flat to make a closed box for safe transportation of tubes. 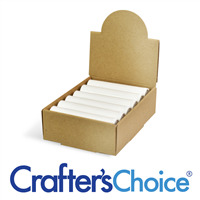 Kraft Lip Tube Box holds (2) round 0.15 oz lip tubes and is a great way to professionally package lip balm. Perfect for gift sets or pairing a lip scrub with a lip balm! Made from recycled material. This Oatmeal Lip Tube Box holds (2) round 0.15 oz round lip tubes and can be used to package your handmade lip balms or lip scrubs. Professional look. Made from recycled material. 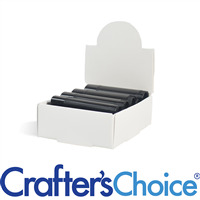 This Lip Tube Box made from coated white paper perfectly holds (2) round 0.15 oz lip tubes. 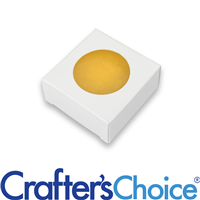 Use this box to package a pair of your best selling lip balms! 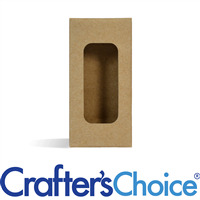 This Kraft Lip Tube Box fits 4 round tubes of lip balm! Use this as the perfect package for lip balm/scrub gift sets. Professional looking box with window in front and large label space on back. Made from recycled material. Use this Glossy White Lip Tube Box to fit (4) round 0.15 oz lip tubes! Makes for a great gift set and looks professional on shelves. Square window in front and large labeling area on back. 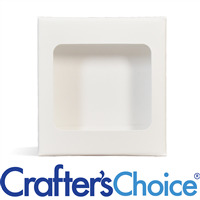 The Kraft Soap Box Gift Set perfectly fits one 0.5 oz Round Lotion Bar Tube and one soap bar from the Crafters Choice™ Rectangle Basic Silicone Mold. This sturdy box is professional looking and perfect for gift giving. See related items for more products that fit inside! The White Soap Box Gift Set is a professional way to package a gift set of 1 Soap Bar and 1 Lotion Bar or Large Lip Tube. This design was inspired by packaging found at famous cosmetic retail stores. 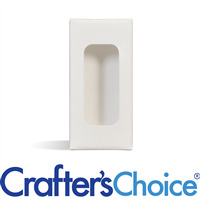 Fits the 0.5 oz Round Lotion Bar Tube Set - Dial Up and the Crafters Choice™ Rectangle Basic Silicone Mold soap bar. See related items for more products that fit inside! 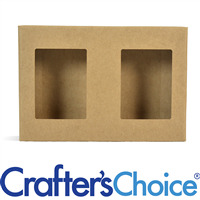 Use this Kraft Double Bar Soap Box to package your soaps for the perfect gift! 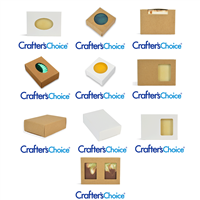 Box will hold 2 bars of soap and includes windows to show off your product. Measurements: 3 13/16" x 5 1/2" x 1 3/16" deep. 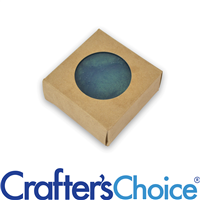 This beautiful kraft box is perfect for packaging your soaps. Add a custom label or design for a great gift! Made from 100% Recycled Paper. Beautiful Kraft Color Inside & Out! Measurements: 2 3/4" x 3 13/16" x 1 3/16" deep. 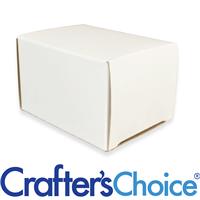 Use this beautiful white soap box with your custom label for the perfect gift or display on your craft show table! Use this soap box for a final touch to your handmade soap bars! The oval window allows customers to peek at your creation! Made from 100% Recycled Paper. Beautiful Kraft Color Inside & Out! 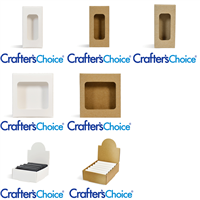 Great for packaging your handmade soaps! This soap box will leave your products looking professional and customers will love it! Made from 100% Recycled Paper. Beautiful Glossy White Color Inside & Out! 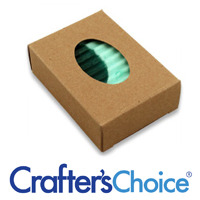 This Kraft soap box creates a convenient way to package your soap. Add a custom label and your soap is ready to go! Made from 100% Recycled Paper. Beautiful Kraft Color Inside & Out! Measurements: 2 9/16" x 3 5/8" x 1 1/4" deep. 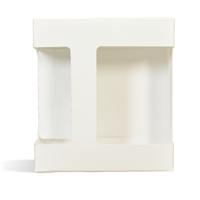 Allow people to get a glimpse of your handmade creation with this White Soap Box with Rectangle Window. This soap box is convenient and professional looking. Made from 100% Recycled Paper. Beautiful Glossy White Color Inside & Out! 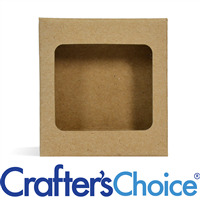 This Kraft Soap Box is perfect for your round soap bars. The window allows for a view of the soap! Made from 100% recycled paper! Beautiful Kraft Color Inside & Out! 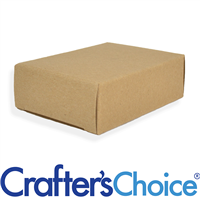 Give your customers a sneak peek at your soap with this kraft soap box. The Top Window allows part of your soap to be seen and smelled, while protecting your product! 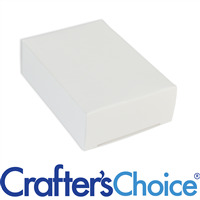 This 1.5" x 4.5" x 4.5" box made with coated white paper is perfect for packing soaps, bath fizzies, bath truffles and more! The box can has a large window that allows you to showcase your pretty products. One sheet of four silver "For You" stickers included.